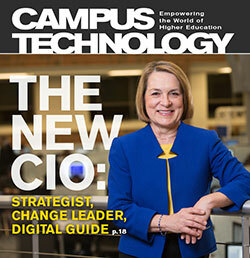 Five higher ed chief information officers discuss their changing role on campus. Harvard researcher Andrew Ho on what we can learn from the first year of edX MOOC data. How SNHU became one of the biggest nonprofit online educators in the country. Savvy institutions are using data to support students from first contact through to graduation. With ever-changing tech needs combined with limited staffs and budgets, art schools may be an IT leader's perfect storm. At Indiana Wesleyan University, interactive projectors have kickstarted collaboration in the classroom.